All families are REQUIRED to work at least two shifts in the FPYC Cheer Concession stand that is open during home football games. What am I getting with my registration fees for game day cheerleading? Your fee covers any organization fees, county usage fees, administration fees, the rental of a cheer uniform (shell & skirt) and rental of pompoms, a FPYC sweatshirt, your briefs and your game day cheer bow. Is there a deposit for the uniform rental? Yes, you must sign Uniform Rental Agreement and pay the $125 uniform deposit to receive uniforms. Your deposit is held and returned at the end of the season once your uniform is returned clean and in good working order for the next season. Please wash on gentle cycle inside out and line dry! Uniform pick up will be based on your squad. These days are held in September at the FPYC Clubhouse. You will receive more details in August. Sweatshirts and other spirit wear items will be sold during the camp in August. *All cheerleaders must have a short sleeve and long sleeve white t-shirt. *All cheerleaders need a pair of all white, smooth bottomed cheer shoes. *We highly recommend you purchase a cheerleader rain coat. We will have these for sale at $15 each during Uniform Distribution Day also. Do you have a scholarship program and/or offer refunds? Yes, we do have a limited number of scholarships available for those who qualify. Please email fpyccheer@gmail.com for qualifying information. These are offered on a first come first serve bases and are only available during the walk in registrations. Each sport director has the option of what type of refund policy they would like to have. Cheer offers a 50% refund of your registration cost until August 1st. The 50% is determined after a $50 administration fee is deducted. From August 2nd-9th cheer offers a 25% refund of your registration cost minus the $50 administration fee. No refunds are given after August 10th unless the withdrawal is for medical reasons. After August 20th no refunds are given regardless of the reason. If your child is asked to leave the program due to absence or behavior problems, NO refund is given. Do you offer a cheer cycle program? 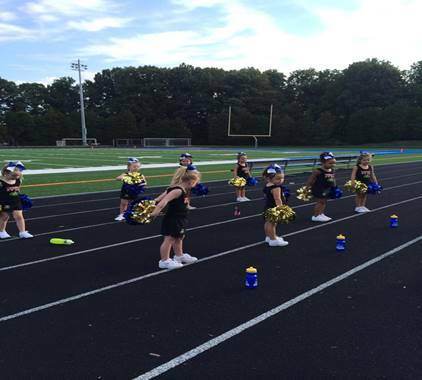 Yes, we do offer a cheer cycle program. Families are welcome to go through the many used cheer items that have been donated to the club. The cheer cycle box is only brought out during uniform distribution day. If you have items you’d like to donate please turn them into the director or your coach at practices. All cheerleaders will attend camp style practices in August. Camp will be held at Draper Drive Park in Fairfax. We are pleased to announce a special cheer day camp (free to ALL FPYC Cheerleaders) with the Fairfax High School Cheerleaders. The date will be in mid-August. Once you are registered you will receive more details. If your child has an issue with these dates, please let me know ASAP. We will be learning a handful of new cheers and our halftime routine during camp. During the second or third week of school we will move to the Lanier Middle School cafeteria (door 7). Please note: If school is closed for weather related reasons or a holiday we WILL NOT have practice! All squads will practice twice a week for an hour and a half. Days and times will vary by coach and squad. Most squads will hold practice from 6:00pm-7:30pm. Games are typically held on Saturdays from 8am-8pm. Most games are held at our home field, Fairfax High School. From time to time there may be an away game or a Sunday game. FPYC Football is part of a much larger youth football league. There are over several hundred teams that must do a final weigh in and then schedules must be made. I typically don’t get the game schedule until 2 days before our first game. Once I have the schedule I will send out your kick off times. Squads are asked to report usually 30 minutes before the kick off time. Please keep in mind the schedule is not set in stone and can change. - Wear clothes without buttons, zippers, etc. Website – Please check this FIRST! If you are experiencing a problem with your coach or something that has happened that needs to be brought to the attention of your coach, please email cheerleading@fpycsports.com or fpyccheer@gmail.com and it will get to Angel (Cheer Commissioner) and will be dealt with appropriately. We will be posting the routines on our YouTube Channel very soon!